I feel bad because I abuse my backpack. It must be 3-4 years old but don’t think I’ve ever washed it. I used it almost every day. I remember my original motivation was to stop using a bag where heavy things strain just one side of my body. Once my coworker told me it made me look like an eighth grader which made me stop using it for a while but I don’t care anymore because it’s still the best way to carry things around a city. My backpack is the perfect size for the things I regularly carry. 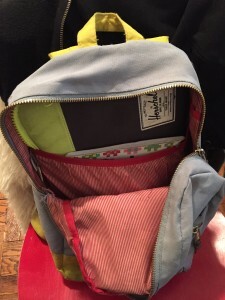 My laptop, notebooks, and books are flat or square and can go securely in the stretchy inside-pocket. Smaller things can go in the small outside pocket. I usually have hair ties, burt’s bees, mascara, a cereal bar, and/or business cards in there. Everything else fits in the larger space: more books, a sweater, a pencil case, a flask, etc. I am a messy person but nothing gets lost. I think I could thrive and remain entertained for 2-3 days on its contents. I can hold any strap while standing on the subway and it won’t touch the floor. This is great because I probably still wouldn’t wash it. The zippers are awesome. The color block is good for helping people understand I am not indie-goth despite my perpetually black outfits. 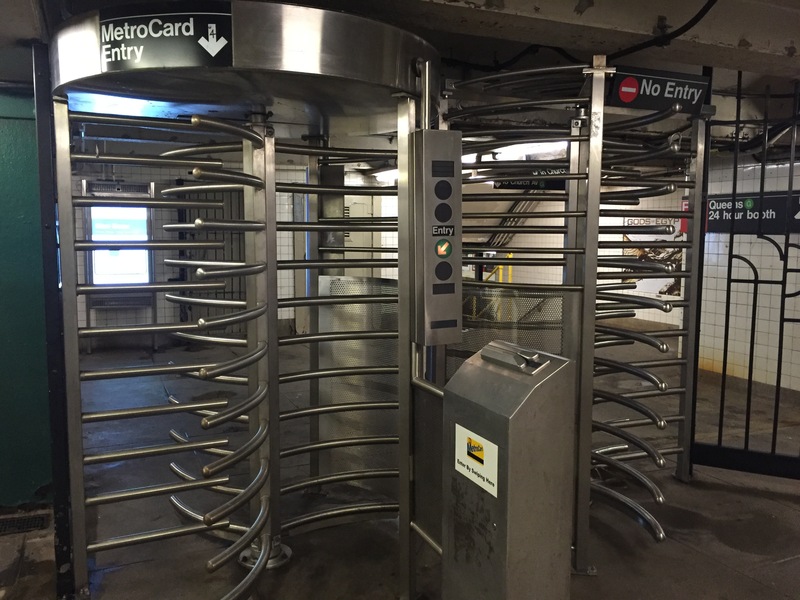 I hate these subway turnstiles. They are scary to look at because they seem capable of squishing humans into 20 pieces. When I googled them I found out they are informally called “iron maiden” turnstiles, after the torture device, which makes sense to me. People take forever entering and leaving them because if you swipe and walk at a normal speed you miss the inevitable indication to swipe again (why aren’t there audibly different sounds for a successful versus failed swipe?). There’s often a line getting on the N/R at NYU because of this. If you have a large bag or a long gait you are screwed. If you push incorrectly, you can easily lose your swipe (which apparently happens very often). At the Parkside Avenue Q station there is an exit with an iron maiden turnstile and an emergency exit. Everyone uses the emergency exit. 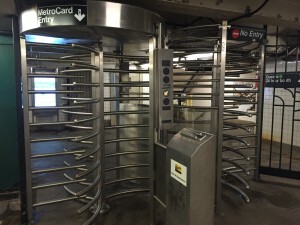 The purported purpose of the torture-device turnstiles is to keep people from jumping them at stations that don’t have toll collectors watching, so this perceived purpose would still have to be the main consideration when creating a new turnstile. According to wikipedia, there are about 160 subway systems in the world, so somewhere there must be a better system. Thinking of my own experiences traveling, I remember the London Underground tap-and-go as the easiest to use. In Santiago, Chile, to exit you pass through a set of small doors that open from opposite ends. I thought of what EZPass does for cars–could something similar make it as easy for traffic to flow through subway turnstiles? I thought about easy things that most people keep on their person at all times anyway, and ways a tag on these items could be read when passing through to the subway to activate the turnstile. I came across some articles suggesting the MTA is already considering and testing some of these technologies. 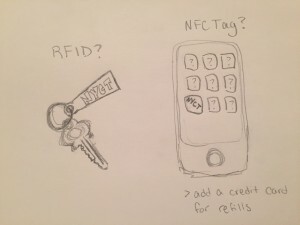 Maybe the RFID tags could be like those CVS/Duane read cards that you keep on a keychain. 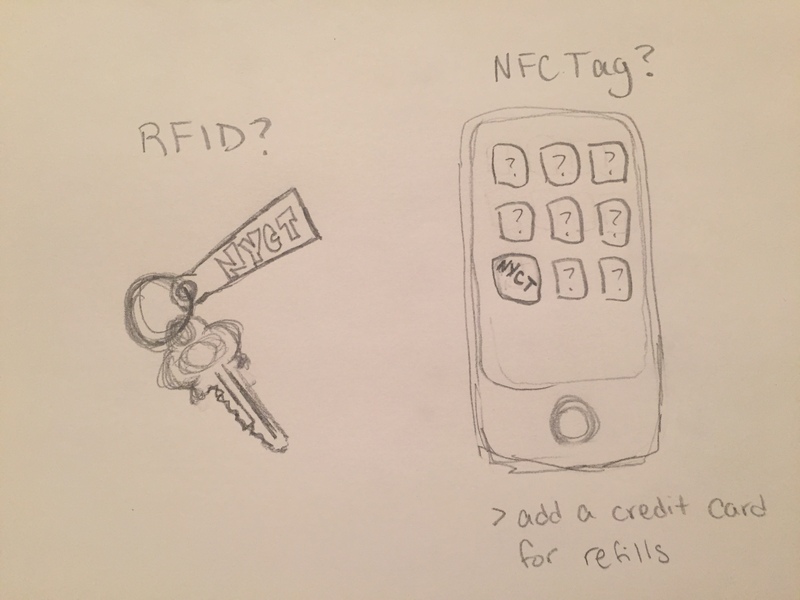 Maybe people could just use an NFC cell phone. I thought about how EZPass is so easy to use on roads, and the effect of the symbolism of the passageway. 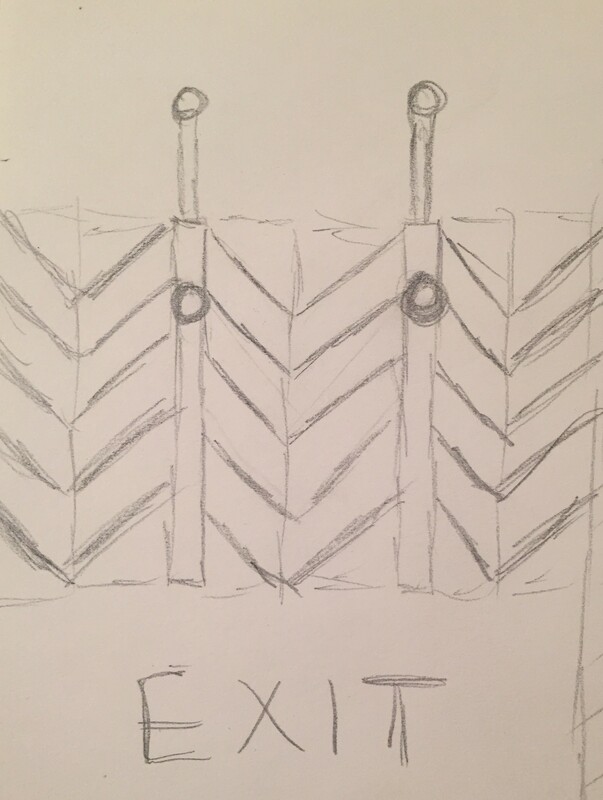 I decided to design chevron doors (or bars that could be retracted) in honor of the ancient bird goddess. EZPass made me imagine that maybe scanning would be unnecessary, and the reader could check your tag as you approached. 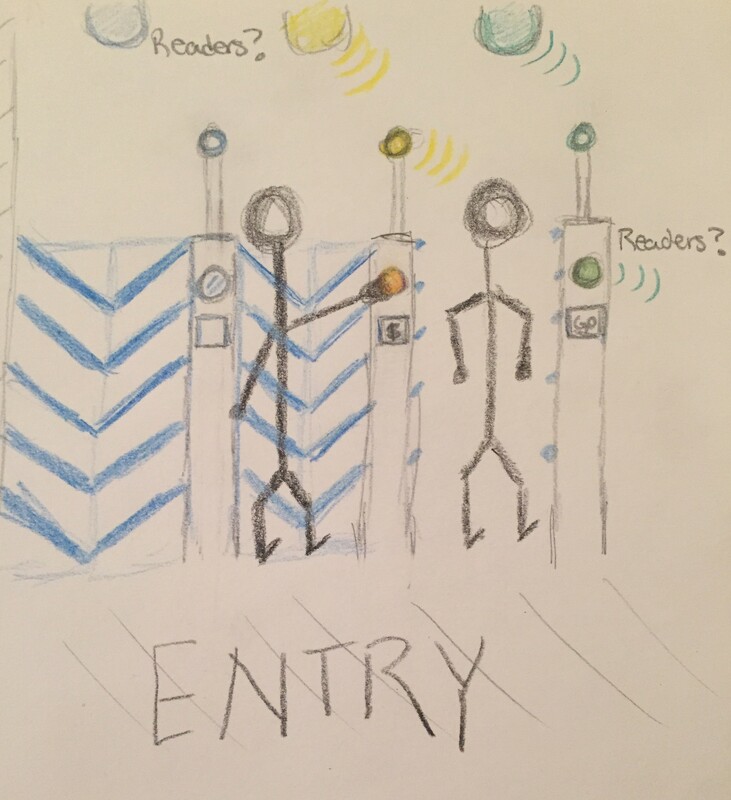 I don’t know if this is technologically feasible, so I depicted scanners as well. 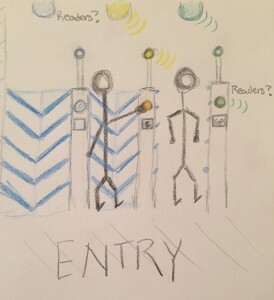 There would also be a sound and light emitted as you were granted entry that’s distinct from when entry is denied, so you have more feedback as you pass through, potentially in a hurry. One passenger is granted entry while the other is alerted to lack of funds. 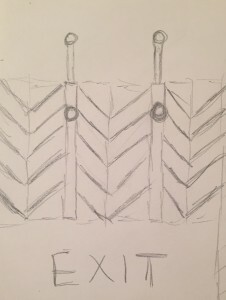 Perhaps the doors could open one way on the exit side, but need a scan to enter on the entry side. Or, there could simply be a large button to open while exiting.